Hurricane oil lanterns have been part of American culture for 150 years. The V&O Pathfinder hurricane oil lanterns stay lit in any weather! This old time lantern style was proven in use on passenger river boats, American steam locomotives, factories in New York City, and on countless farms where farmers found their way in the dark howling winds to feed livestock in winter storms. Appropriate for indoor and outdoor use. The traditional frame and authentic construction of the hurricane oil lantern is easy to use. A convenient side lever lifts the glass globe assembly to easily light and trim the wick. The handle allows for easy and gentle carrying from place to place. 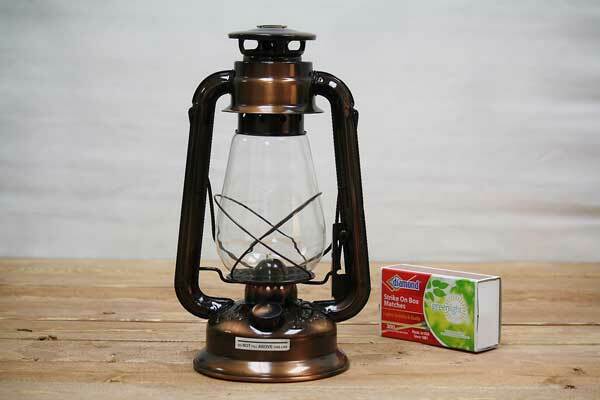 V&O is a well-known company known for its economical powerful camping lanterns. Made by V&O Lanterns. Select from a green or bronze finish. Cant find a cap for v&o green lantern ,has no mod. number. bought dietz cap , a little to big . Can you help.